As you look across the sea of readers, if you see someone with 101 on the back of their shirt, that is me. Wouldn't it be kinda cool if we were all reading in one place? As someone else brought us food and the laundry didn't nag? My start time: 7:48 am Saturday. Yeah, I know I'm not going to win, but I'll have fun playing! 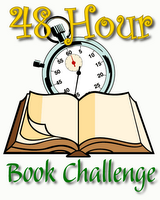 Links: MotherReader's 48 Hour Book Challenge. The Rules. Oh don't stop with food! I'd like people around to give back rubs and foot rubs, and hot tubs and a power nap room and perhaps an exercise room where we could listen to our one allowable audio book...or perhaps a room filled with various ergonomic (is that the word I want?) exercising chairs and ball things so that we could read in various healful postures...at this point, I'm sick of both sofas and both comfy chairs. If only we could combine the conference and the readathon. That would be a blast. Except I would be yelping and shrieking at all the twists and turns in my books, prompting a split reaction of "SHHHHH! No spoilers!" and "I KNOW, right?" from everyone else in the room. Probably a good thing we are doing this via blogs. Oh, I like the idea of the convention site...perhaps even a short variation of a Challenge? We could get the airport massage people to come over...they are very close to the hotel for this fall or we could recruit the Pentagon City mall chair massage operation to come over after hours, they are perhaps even closer.....hmmmmmm. Ooooh, yes, a conference that is reading--or how about reading alternating with author and other panels? And regular food and snacks and hotel rooms...How goes the reading? dude. All of us on a retreat just reading and being pampered? Kool. But there would have to be a child care room. I'm thinking Club Read on a tropical island... MMMMmmm. Back to the books. A hammock would be nice, and a constant supply of diet cokes, and maybe a catheter. Oh no, I did NOT say that. How did you do on your reading? Please sign in at the Finish Line post so I can count you in. (BTW, do you need that CF ARC, because I apparently have 4 - count them, 4 - people who read the entire 48 hours. I know.